In today's edition of A Recipe For Disaster, Alyce Oh takes on the challenge of baking croissants from scratch. The basis of just about any French-style pastry is laminated dough, which consists of alternating layers of flour and butter that when baked, create puffy, flaky magic. It’s an intensely arduous process—a rite of passage, if you will—to make your own, as it requires a full day of handling the dough every few hours. 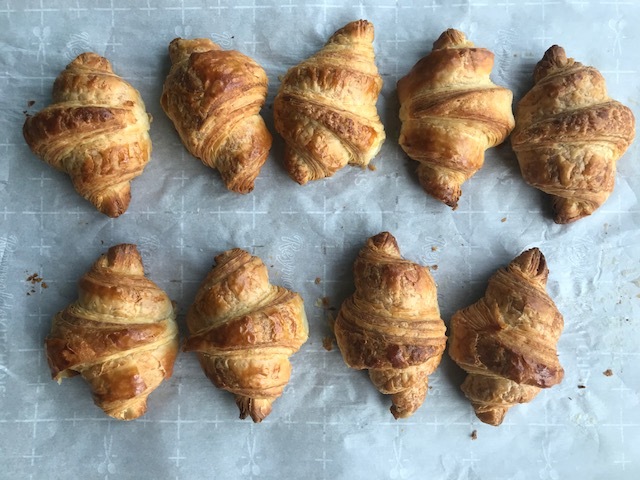 As a seasoned baker that still lacked laminated dough from her repertoire, I figured it was time to take the leap—and what better way to do it than with croissants? After a brief scouring of the internet for a reliable recipe, I settled on one from thetarttart blog, which is an adaptation of a recipe from Tartine Bakery in San Francisco. Staying true to their roots in bread-making, Tartine has created a recipe that begins with a preferment, a fermented starter dough that’s supposed to lend the croissants a slightly tangy edge. It also doesn’t require a butter block, but calls for butter to be spread directly onto the dough itself. These are unusual for laminated dough, but the visual evidence of a winning recipe was too compelling to deny. So at 6:30 am on a Saturday morning, I trudged into the kitchen to begin preparing the preferment. The preferment was simple and standard in ingredients, calling for warm milk, yeast, and a little flour. This was left to ferment for two hours, after which more yeast, flour, sugar and butter were added and mixed through. The recipe calls for a stand mixer with a dough hook, but it worked just as fine with a wooden spoon and some elbow grease. The dough was allowed to rise for an hour, formed into a rectangle, then left to rise again for four hours. The next step was the combination of butter and dough, which marks the start of the lamination process. This was the most difficult part of the recipe for me, since it required beating cold butter until malleable—not an easy task to complete by hand. But once the butter was softened and applied to the dough, the actual folding and rolling of the lamination was easy. After a series of folds and rest, the dough was finally ready to be rolled out for the final time, cut into right triangles, and formed into little horns. I felt pretty confident at this point, but then came the inevitable “oh no” moment when I realized that the final rest was supposed to be at room temperature, and not in the fridge. This delayed the process by three more hours, so that by the time the croissants got into the oven, it was past 1 am. Needless to say, it was a cathartic moment when I finally slid the tray in, closed the door, and anxiously crouched by the oven—Great British Baking Show style—for the next 25 minutes. The final results were gratifying, to say the least. The croissants were incredibly buttery and flaky with very pronounced layers, and a slightly chewy interior. I couldn’t really detect much of a tang, but I suppose that leaving the preferment to ferment an hour or two longer might have done the trick. It was an exhausting process, but one that I would definitely be willing to undertake again in the near future. To up the ante, perhaps pain au chocolate or almond croissants? Either way, I’m going to need a whole lot more butter.